My parents recently visited me for spring break, and we started off by heading down the coast. We ate burritos and caught the sunset in Laguna Beach. 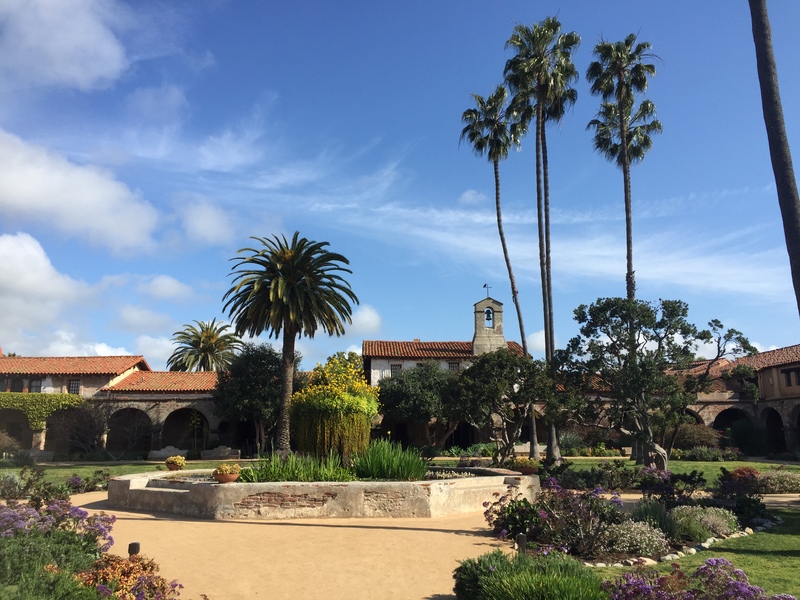 The next morning, we arrived at Mission San Juan Capistrano soon after opening. The mission is very pretty, and the well-tended gardens were gorgeous. We apparently missed St. Joseph’s Day and the Return of the Swallows by a few days, but I saw nary a swallow (it seems like the mission is going to great lengths to attract them back–there were artificial nests and recordings of mating calls). The ruins of the Great Stone Church, destroyed by an earthquake, reminded me a bit of the Ruínas do Carmo in Lisbon. I liked the painted beams, painted motifs, and organ in Serra Chapel (which has the distinction of being the only church still standing in which Father Junipero Serra celebrated mass). The ornate alterpiece was less to my taste. I liked the bells too, including the bell-gable (maybe it wasn’t one, but it reminded me of what I saw in southern France last summer), and the cloisters. 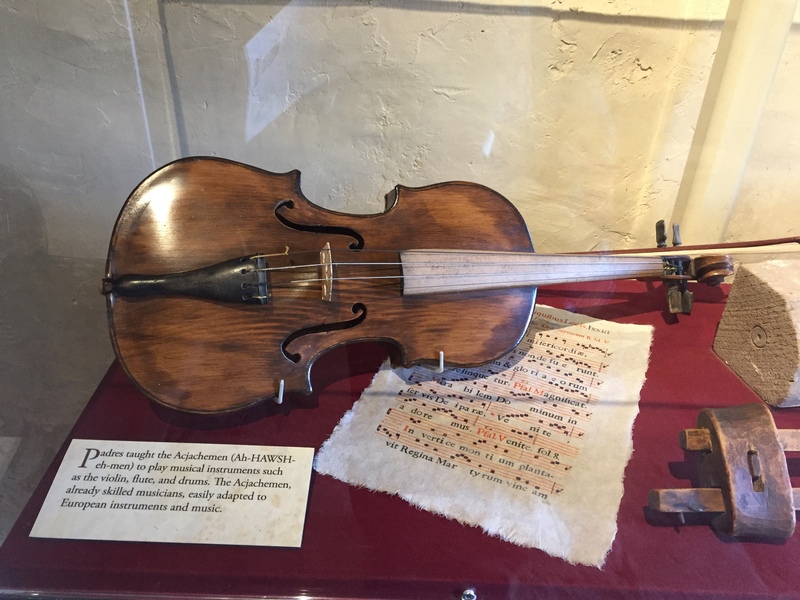 There were exhibits displaying both treasure and objects from daily life, including a bookcase of old volumes, a gloria bell wheel (like a spinning wheel with bells attached around it), and Acjachemen baskets. The gardens boasted many plump cacti, manzanita trees, California poppies, succulents, and a huge jasmine vine in full fragrant bloom. 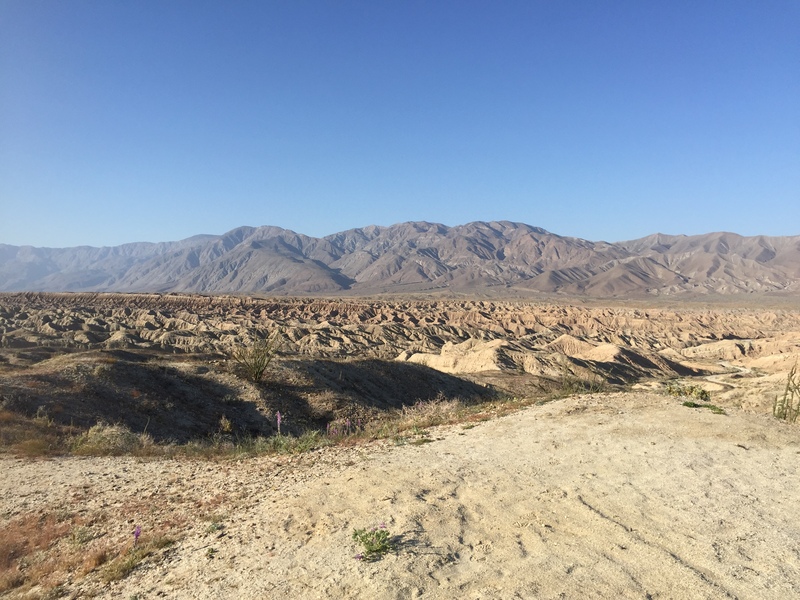 From San Juan Capistrano, we drove inland to Anza-Borrego Desert State Park, which we had first visited two years ago for the 2017 superbloom. After picnicking in Christmas Circle, we arrived at the headquarters of California Overland Desert Excursions for our afternoon tour of the badlands. 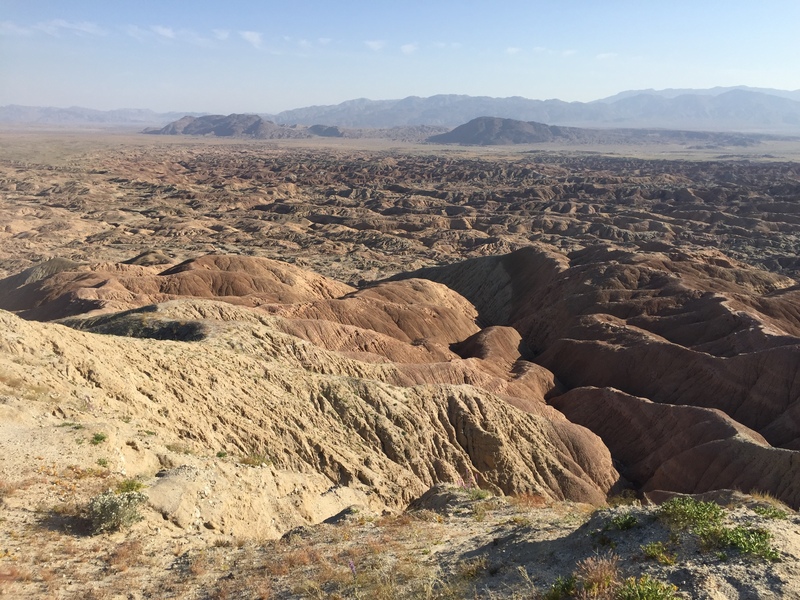 (I didn’t know there were badlands other than the ones in South Dakota; the formations do look alike.) 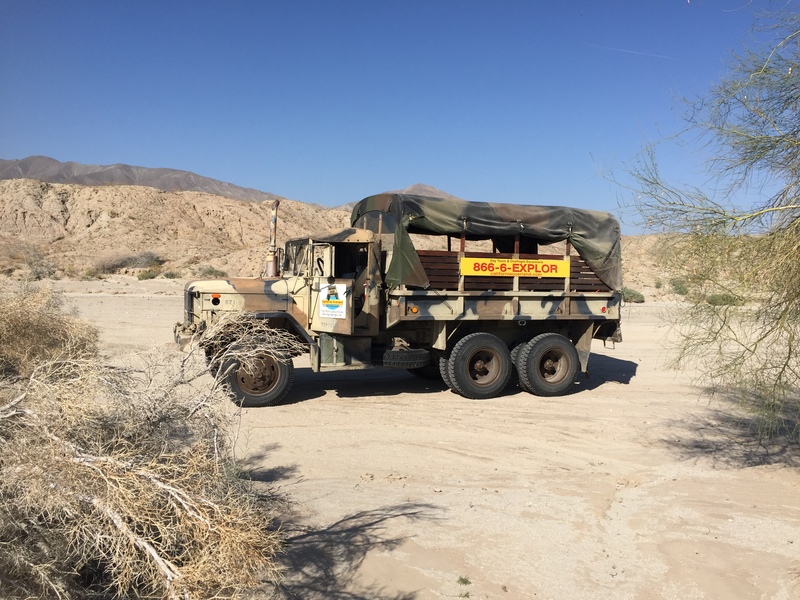 The advantage of the tour was that we’d ride in a 10-wheel military truck on unpaved roads and desert washes to parts of the park that would be inaccessible to us in our rental car. Our guide, Joe, first oriented us to the region and showed us paintings of what it looked like in earlier prehistoric ages, when the climate was (sub)tropical and megafauna roamed. Then we all climbed a ladder into the back of the military truck, where there were green-upholstered benches, and off we went. Our first off-road detour was to the Truckhaven Trail to see some blooming desert sunflowers, with a little sand verbena thrown in. Then we started down a path on the other side of the highway. Joe stopped so we could get out and see some ghost flowers blooming along the trail. 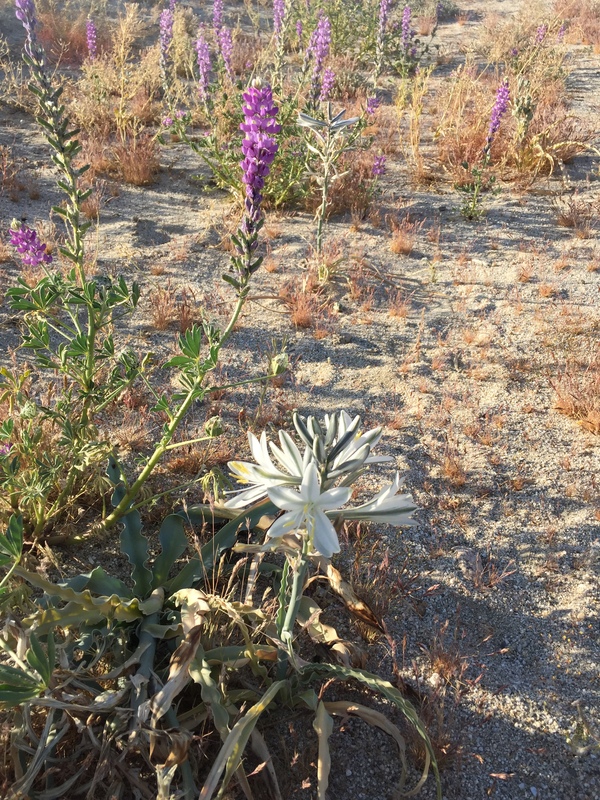 This is a rarer desert flower, I believe, and it has pretty speckles inside the cup of its pale petals. 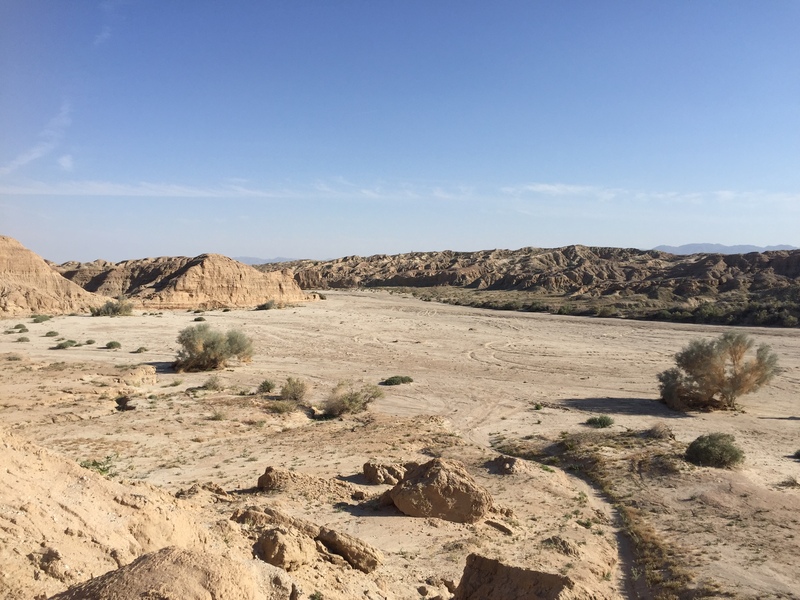 Further on, we reached the badlands and got out again to explore the landscape. The sandy ground glittered with pyrite. There were flowers here and there, and caterpillars, and a large round spotted beetle. The truck was parked in the wash near a palo verde and a smoke tree. I particularly liked the smoke trees; they looked like they were made of silver and gold. Joe also showed us a big creosote. We took a break for some snacks and lemon water and then drove a little farther on to see a mud cave (perhaps a century or two old) carved into the rock formations by water. 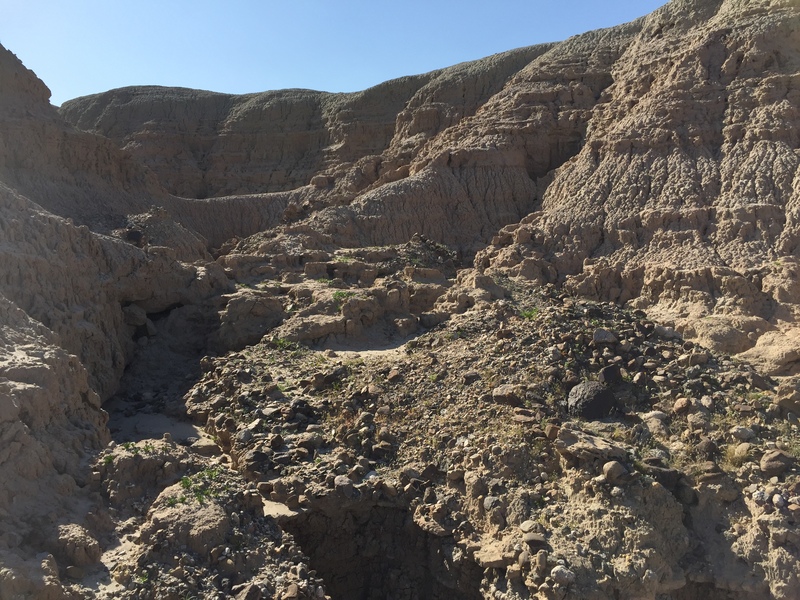 Next we drove on and upward to Vista del Malpaís, which afforded views of the folds and ridges of the badlands, the wider valley, and the mountains ringing it in all directions. There were a lot of lupines blooming up here. After taking it all in, we returned to headquarters via a trail Joe called the rollercoaster for its ups and downs. I don’t usually go in for tours, but this one was well worth it.